‘Instant Clone’ also known as VM Fork or Project Fargo, gives admins the ability to rapidly clone and deploy virtual machines, as much as 10x faster than what is currently possible today. Instant Clone uses rapid in-memory cloning of running virtual machines and copy-on-write to quickly deploy clones of a parent virtual machine. Because Instant Clone uses a private API, PowerCLI is currently the only way Instant Clone can be accessed and leveraged. The Instant Clone capability allows admins to ‘fork’ a running virtual machine, meaning, it is not a full clone. The parent virtual machine is brought to a state where the admin will Instant Clone it, at which time the parent virtual machine is quiesced and placed in a state of a ‘parent VM’. This allows the admins to create as many “child VMs” as they please. These child VMs are created in mere seconds (or less) depending on the environment (I’ve seen child VMs created in .6 seconds). The reason these child VMs can be created so quickly is because they leverage the memory and disk of the parent VM. Once the child VM is created, any writes are placed in delta disks. When the parent virtual machine is quiesced, a prequiesce script cleans up certain aspects of the parent VM while placing it in its parent state, allowing the child VMs to receive unique MAC addresses, UUID, and other information when they are instantiated. When spinning up the child VMs a post clone script can be used to set properties such as the network information of the VM, and/or kick off additional scripts or actions within the child VM. In the demo below you will see a walkthrough of verifying the intended-parent VM’s network settings, and that the VM is in the desired state to instant clone. It then walks through the PowerCLI commands to create 9 child VMs off of the parent VM. On my equipment it took me 15 seconds to create 9 Instant Clone child VMs of a Windows Server 2012 Parent VM. Times will vary based on a number of factors including the number of configuration parameters saved to each virtual machine, hardware, etc. 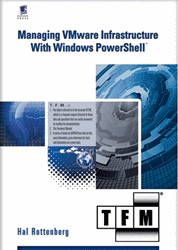 You can download the user guide and PowerCLI Extensions module from the VMware Flings site HERE. I strongly recommend reading the user guide and following the step-by-step instructions for getting started. Originally the PowerCLI Extensions module included VSAN cmdlets. As of PowerCLI 6.0 R1 those cmdlets have been removed from PowerCLI Extensions and added into PowerCLI. New-InstantCloneVM : 8/4/2015 4:04:58 PM New-InstantCloneVM The Vm ‘testvm’ is not instantclone parent. (Rather then specifiying the parentVM name directly). I really looking forward to see this feature in vRealize Automation soon! Pingback: VMware Labs: Top 5 Flings - VIRTUALIZATION IS LIFE! Question about a Windows Guest after it’s been cloned and gets a new IP adress… What about the computer name, the secure computer account with the domain controller, Dynamic DNS, etc? Is it up to the administrator to fix all those potential issues after the instant clone is instantiated? Does anybody now what happens if I want to change the disk space of an “instant-clone(d)” VM? Is it right to assume that I then need to invest a lot of time transforming it into a fully-cloned VM? So my understanding (from reading the 2009 SnowFlock paper) is that at least in-principle this doesn’t need to be a problem. Conceptually Instant Clone is an extension to Link Cloning (it’s that same + COW memory deltas), since Linked Cloning supports VMDK re-sizes I’d expect Instant Clones to support it as well. Whether or not the concept matches reality is not something I know. Cool stuff, any chance this (or some low level variant of this) will show up in vSphere Web Services API? Pingback: Instant Clone. VMFork, Project Fargo – VM Man | VMware ,vsphere esxi ,VMware Course ,VCP Course ,Cloud ,VDI ,Hyperv ,Citrix ,شرح كورسات. sein muss, um die Gesundheit zu stärken. I get an error that “the operation is not supported on the object”. Any thoughts? My VM is a Cisco Virtualized router that does not have the ability to have VMWare Tools installed. So in other words, its an ‘Other’ type of VM. I cant get InstantClone to work and get this error. Any thoughts? Workaround? VMware tools are not running. Instant Clone requires VMware Tools. If your VM does not have VMware Tools installed, IC will not work. Pingback: Cost Reduction for Home Lab… Instant clone ESXi for vSAN testing :) | What's Next...?